aFrom the Institute of Neuroradiology (A. Hock, S.S.K. ), University of Zurich, Zurich, SwitzerlandbInstitute for Biomedical Engineering (A. Hock, A. Henning, P.B. ), University and ETH Zurich (Swiss Federal Institute of Technology), Zurich, Switzerland. bInstitute for Biomedical Engineering (A. Hock, A. Henning, P.B. ), University and ETH Zurich (Swiss Federal Institute of Technology), Zurich, Switzerland. SUMMARY: MR spectroscopy allows insight into the chemical composition of human tissue noninvasively. Thereby it can help to better characterize pathologic processes affecting the spinal cord and may provide important clinical markers for differential diagnosis. However, due to technical challenges, it has been rarely applied to the spinal cord. The aim of this review was to summarize the technical development and clinical studies using MR spectroscopy in the spinal cord. Main challenges of applying MR spectroscopy in the spinal cord are discussed, and a description of a state-of-the-art scan protocol is given. In conclusion, MR spectroscopy is a promising tool for research and diagnosis of the spinal cord because it can provide additional information complementary to other noninvasive imaging methods. However, the application of MR spectroscopy in the spinal cord is not straightforward, and great care is required to attain optimal spectral quality. MR spectroscopy enables the determination of metabolite concentrations in a predefined region of interest in the human body, both noninvasively and in vivo. In contrast to other MR imaging techniques, such as diffusion-weighted imaging, blood oxygen level–dependent contrast imaging, or structural MR imaging methods, MR spectroscopy provides information about the chemical microenvironment from atomic nuclei in a variety of functional groups. This allows detection of changes in the concentration of various metabolites for investigating healthy tissue and pathologic processes and exercise- or drug-induced changes. In vivo, MR spectroscopy is mainly based on proton (1H), carbon (13C), or phosphorous (31P) nuclei. Due to the 100% natural abundance and the highest gyromagnetic ratio of protons1 among the above-mentioned nuclei, 1H-MR is the most sensitive in vivo spectroscopy method. In addition, 1H-MR spectroscopy requires the same hardware as clinical MR imaging and can thus be integrated into clinical scan protocols in an efficient way. Hence 1H-MR spectroscopy became a promising tool for basic physiologic studies and clinical diagnosis. The information obtained by MR spectroscopy may often prevent unnecessary invasive interventions, thus avoiding further negative impact on patient outcome. These applications have just begun to be implemented in the evaluation of patients with spinal cord disease. Other potential applications specific to the spinal cord include investigation of neuroregeneration and reorganization following spinal cord injury and monitoring during rehabilitation or pharmacologic therapies. The response to therapy may be predicted on the basis of specific biomarkers (eg, N-acetylaspartate, choline, creatine) to enable personalized treatment. MR spectroscopy quantifies multiple metabolite concentrations that reflect the state of energy metabolism, myelination, neuronal attenuation and function, glial impairments, or altered membrane turnover and, therefore, can be a valuable tool for the investigation of spinal cord pathologies. 1) Strong susceptibility changes, related to the anatomic tissue heterogeneity (vertebral bodies, CSF, muscle tissue, and so forth) around the spinal cord, lead to spatially periodic distortions of the static magnetic (B0) field along the spinal cord.5 This distorts the line shape of the spectra and reduces the SNR. 2) The small diameter of the spinal cord (approximately 1 cm in the cervical cord and even lower in the thoracic and lumbar cord6) limits the possible voxel size, resulting in a low SNR and potentially imprecise quantification of metabolite concentrations. 3) The attainable SNR is also limited by the relatively great distance from the region of interest to the receive coils; for example, in the cervical spinal cord, the distance is approximately 5 cm in all directions and can reach >15 cm in the lower cord regions. 5) Subject motion is another severe problem because voxel dimensions are in the range of millimeters and are maximized to include as much spinal cord tissue as possible for increasing the SNR. Hence, patient motion in the range of millimeters (which is not unlikely considering the relatively long scanning times needed for spectroscopy) would already move the position of the voxels considerably out of the spinal cord. The result might be the contamination of the spectra with resonances of non-neural tissues, such as lipids, from nearby bone marrow or muscles and a further reduction of the SNR for the metabolites of interest. 7) Anatomic variability, subject motion, or pathophysiologic changes of the electromagnetic tissue properties may affect the transmit (B1) field and hence alter desired flip angles, localization profiles, and SNR. 8) With conventional MR spectroscopy localization techniques such as the point-resolved spectroscopic sequence, the signal of different metabolites stems from slightly different regions (chemical shift displacement artifact1). If one considers the small size of the spinal cord, the excitation volumes for some metabolites might be shifted partially out of the cord region. This has to be considered to minimize measurement errors with regard to relative metabolite concentrations (see “Inner- and Outer-Volume Suppression”). All of the above-mentioned technical problems lead to a reduction of the spectral quality and thus to a reduction in the amount of reliably detectable metabolites (eg, Cramér-Rao lower bounds ≤20), which diminish the clinically usable information content. Therefore, optimizing and improving spectral quality is necessary to obtain meaningful data. The following issues should be addressed in the scan protocol to optimize the spectral quality and to enable reliable metabolite quantification in the human spinal cord in vivo. To measure exclusively cord tissue, to gain optimal SNR and B0 shim quality, one must apply effort to ensure accurate voxel placement. Cooke et al5 recommended a voxel size of 9 × 7 × 35 mm3 and appropriate placement so that the lower limit of the voxel level is aligned with the inferior border of the C2 vertebral body. In some investigations, the voxel dimensions are kept constant but smaller than the previously recommended size, to ensure that the voxel size fits even in subjects with a small spinal cord diameter,9,14,19,22,29,30,33,36,37 whereas others adapt the voxel size to each individual subject.17,18,20,21 Edden et al26 introduced 1D proton MR spectroscopy imaging in the spinal cord at 3T. However, the huge excitation volume of 90 × 10 × 12 mm3 might be difficult to apply in a curved spinal cord. Exemplary planning based on sagittal and axial T2-weighted turbo spin-echo images of the cervical spinal cord. Due to the chemical shift displacement artifact, the signal of different metabolites stems from different regions. For example, spectral voxels from NAA (red voxel) and myo-inositol (green voxel) are shifted against each other. Applying narrow (approximately 10 mm) sharp-edged inner-volume saturation bands (blue) with high bandwidths (>10 kHz) reduces this artifact. The saturation pulses above and below the spectroscopy voxel also facilitate flow compensation. Effect of patient motion. Axial T2-weighted images with planning of the measurement voxel (red box, NAA; blue box, myo-inositol; green, B0 shim volume; blue transparent, IVS) before (A and B) and after (E and F) MR spectroscopy acquisition (C and D). Increased line width, lower SNR, and additional lipid peaks may occur in motion-affected measurements (D) compared with non-motion-affected acquisitions (C). Localized saturation bands are frequently used to reduce CSF flow artifacts, to suppress signals from outside the voxel, and to overcome the chemical shift displacement artifacts (see “Technical Problem” 8).1 To that broadband, radio-frequency pulses with a small transition bandwidth should be used. Because saturation pulses can be designed to have a much higher bandwidth (>10 kHz) than the localization pulses, the chemical shift displacement artifacts can be substantially reduced by saturating the nonoverlapping areas of the metabolite-specific excitation volumes. Henning et al17 demonstrated how IVS can be applied in the spinal cord (Fig 1). This technique was also used in Hock et al18,19,29,30 in combination with a reduced thickness of the saturation band (10 mm), which further reduced the chemical shift displacement artifact and sharpened the saturation section profile. Respiratory triggering and gating were not used for MR spectroscopy in the human spinal cord until now. However, distinct dynamic B0 field fluctuations occur due to breathing at high B0 fields and/or during acquisitions in lower regions of the spinal cord. A recent technique to reduce the influence of dynamic B0 changes is the phase and frequency alignment of each free induction decay by using non-water-suppressed 1H-MR spectroscopy before spectral averaging (compare with the section “Water and Fat Suppression”).19,30 Nevertheless, whether the use of respiratory triggering/gating is feasible is yet to be investigated because it might lead to severe scanning-time prolongation. More advanced solutions such as real-time B0 shim updating, as recently demonstrated for breast MR spectroscopy,38 are also promising for spinal cord MR spectroscopy. Static B0 inhomogeneity is one of the major problems in MR spectroscopy of the spinal cord because it leads to broadening of the resonance lines and hence to a further reduction of the achievable SNR and spectral resolution. Unfortunately, many authors are not specific in describing their B0 shimming routine. Different B0 shimming techniques like manual B0 shimming,11,13,15 B0 shimming based on static B0 maps,17,18,23 and iterative B0 shimming or a projection-based B0 shimming39⇓⇓–42 approach18,19,26,29,30 have been used to reduce B0 field distortions. Hock et al18,29 compared different B0 shimming techniques and demonstrated that ECG-triggered, second order, projection-based B0 shimming resulted in the best spectral quality (full width at half maximum of the water peak around 9 Hz at 3T) and reproducibility. The use of a third31 or even higher order or dedicated local B0 shim coils might further improve these results in the future. The concentration of water in nervous system tissue is much higher than the concentration of metabolites1; thus, the water peak around 4.7 ppm dominates the spectrum and can lead to baseline distortions and gradient vibration-induced signal modulations.1 Therefore, the water peak is usually suppressed (or reduced), for example, with chemical shift selective43 water suppression,3,5,9,16,20⇓⇓–23,27,28 or with asymmetric variable power RF pulses with optimized relaxation delays (VAPOR).29,30,44 In addition, Hock et al19,30 showed that MR spectroscopy in the spinal cord is possible without water suppression by using the metabolite-cycling technique.45 The advantage of this technique for spinal cord MR spectroscopy is that the high water peak can be used for frequency and phase alignment of single acquisitions before spectral averaging, which reduces the resulting line width of the spectrum and thus increases the obtainable SNR. Some groups12,24,26 used a combined water and fat suppression, for example, by application of dual-band hyperbolic secant pulses.46 However, lipid concentration is very low in the healthy spinal cord; thus, it will not disturb the spectrum as severely as the water peak. Thus, the lipid peak does not need to be suppressed. In addition, an elevated lipid signal can be used as an indicator of subject motion (voxel position displaced to an area with high lipid concentration [Fig 2]) or inefficient spectral localization. Another argument for not using fat suppression is the potential suppression of metabolites lying in the frequency range of the fat-suppression pulse, such as lactate or macromolecules, which may provide important information on the nature of pathologic tissues. Most publications show spinal cord MR spectroscopy results of the upper part of the cervical region.3,5,9⇓⇓⇓⇓⇓⇓⇓⇓⇓⇓⇓⇓⇓⇓⇓⇓⇓⇓–28 Additional problems in lower regions are the following: 1) a reduced diameter of the spinal cord,6 which further reduces the possible voxel size and thus the SNR; 2) a larger distance between coils and the region of interest (in the thoracic part around 5–15 cm); and 3) increased spatial and temporal B0 and B1 inhomogeneity caused by the higher impact of cardiac and respiratory motion due to the closer proximity of the heart and lungs. However, 3 publications3,17,25 have shown decent results in lower cord regions in cases of large tumors obliterating the subarachnoid spaces and thus reducing the CSF flow and allowing an increased voxel size. Settings for TE range from TE = 305 to 4325 ms over 14424 to 28825 ms. Short TEs enable higher SNR and detection of metabolites with short T2 times. On the other hand, a long TE can be used additionally to differentiate, for example, the lactate peak around 1.3 ppm from lipid resonances.25 The settings for the TR range from TR = 59015 to 30005 ms (mostly 2000 ms as in Henning et al17), and the excitation flip angles are usually set to 90° as in Henning et al.17 Adaptations of these values considering the Ernst angle (see de Graaf1) might be useful. Postprocessing includes averaging of the free induction decays, Fourier transformation, phase and eddy current correction, and time-domain filtering. Therefore, additional acquisitions of unsuppressed water spectra are frequently added12,17,20,21,23,24,29,30 for phase and eddy current correction with the technique described by Klose.47 However, if the metabolite-cycling technique demonstrated in Hock et al19,30 is used, these corrections can be performed without additional acquisition of non-water-suppressed spectra, and additional phase and frequency alignment can be applied before spectral averaging. Quantification of metabolite concentrations is the main goal of spinal cord MR spectroscopy. Some groups show absolute quantification results,5,9,10,16,21,26 while others show concentration ratios.11,13,15,17,19,20,22,23,27⇓⇓–30 However, metabolite quantification may be complicated by several technical pitfalls. An overview of the quantification challenge can be found in Heinzer-Schweizer48 and de Graaf.1 While some authors used quantification software provided by the scanner manufacturer or their own fitting tools,5,11⇓⇓⇓–15,24,26 most authors used the LCModel49 (Stephen Provencher, Oakville, Ontario, Canada)9,10,17,19⇓⇓⇓–23,27,28 or jMRUI (http://www.mrui.uab.es/mrui/mrui_Overview.shtml)16,35,50 for fitting the spectra, which improves the comparability of the results. However, the wide range of quantification results in healthy volunteers (On-line Table 1) highlights the difficulty of this procedure and its reliance on different acquisition and quantification methods. Primary requirements for a dependable quantification are high spectral quality (high SNR and small line width) and an artifact-free signal. Cramér-Rao lower bounds of each metabolite fit, mean and SD of the line width and SNR (eg, of the highest metabolite peak), coefficient of variation of the measurements, plots of single subjects, and group average spectra are necessary to give the reader a chance to evaluate the reliability of the results. Unfortunately, few publications provide sufficient quality indicators as can be seen in On-line Tables 1 and 2. Currently, spinal cord MR spectroscopy allows the investigation of 4 major metabolites in healthy volunteers: NAA, Cho, Cr, and myo-inositol. Moreover, additional metabolites like lactate or glutamate/glutamine may become visible in patients. In addition, information about macromolecules and lipid can be retrieved from spectra but may show a dramatic intersubject variability. A further increase of the SNR may be the key to uncovering additional metabolites: Hock et al19,30,36 also could detect scyllo-inositol with CRLB below 25% by using non-water-suppressed proton MR spectroscopy. In conclusion, a state-of-the-art protocol includes the following: high-resolution localization images to verify the voxel position frequently; point-resolved spectroscopic sequence localization with short TEs (≤30 ms); an acquisition time of 512 ms; an SNR efficiency-optimized excitation flip angle and TR pair (for an excitation flip angle of 90°, a TR ≥ 2000 ms should be used); IVS; optimized water-suppression or non-water-suppressed 1H-MR spectroscopy with frequency alignment of single free induction decays; ECG triggering; ECG-triggered, projection-based, higher order shimming to ensure a narrow line width (<0.1 ppm); a high number of averages (eg, 512 resulting in a total scanning time of approximately 17 minutes); and sophisticated hardware (eg, high field strength [≥3T] and dedicated spine coil arrays) enabling a high SNR (≥4). Molar metabolite concentrations and concentration ratios measured with MR spectroscopy in the spinal cord in healthy volunteers are summarized in On-line Table 1. Unfortunately, there is a lack of quality indicators in many publications. In addition, in some studies, sample spectra indicate high artifact content (lipid peaks, phase shifts, ghostings, water-peak-affected baseline). However, data published by Marliani et al21 and Hock et al19,29,30 (Fig 3) feature acceptable SNR, low line width, low CRLB, and sample spectra free of major artifacts, making the results reliable. The differences among these studies are most likely attributed to the different water-suppression techniques used, which influence the spectra baseline. Because of the absence of a criterion standard for measuring metabolite concentrations in vivo, additional measurements and cross-validation against invasive methods (ie, in biopsies of patients or postmortem examinations) are needed to verify the results. In contrast to controls,30 spectra (A) measured in different pathologies (B–E)33,37 in the spinal cord show a distinct change in the metabolite fingerprint, with high correlation to connatural MR spectroscopy acquisitions in the brain. 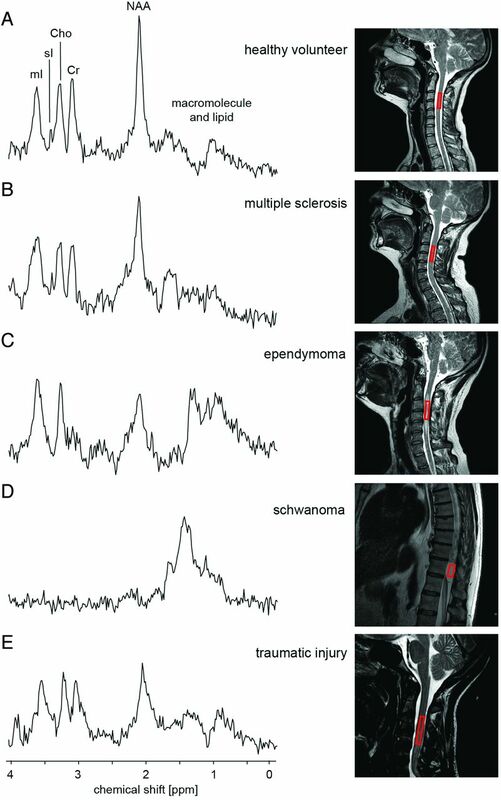 Spectra measured in the normal-appearing spinal cord of patients with MS33 show an increase of myo-inositol/Cr and Cho/Cr and a decrease in NAA/Cr. The extradural tumor (schwannoma) shown in D does not contain any metabolite observable in healthy neural tissue.33 In contrast, the biopsy-confirmed ependymoma exhibited strongly reduced NAA/Cr, increased Cho/Cr, and strongly increased myo-inositol/Cr, in addition to increased lipid and lactate, compared to controls.33 The spectra measured in a patient after a traumatic injury37 also show a reduction in the NAA/Cr. 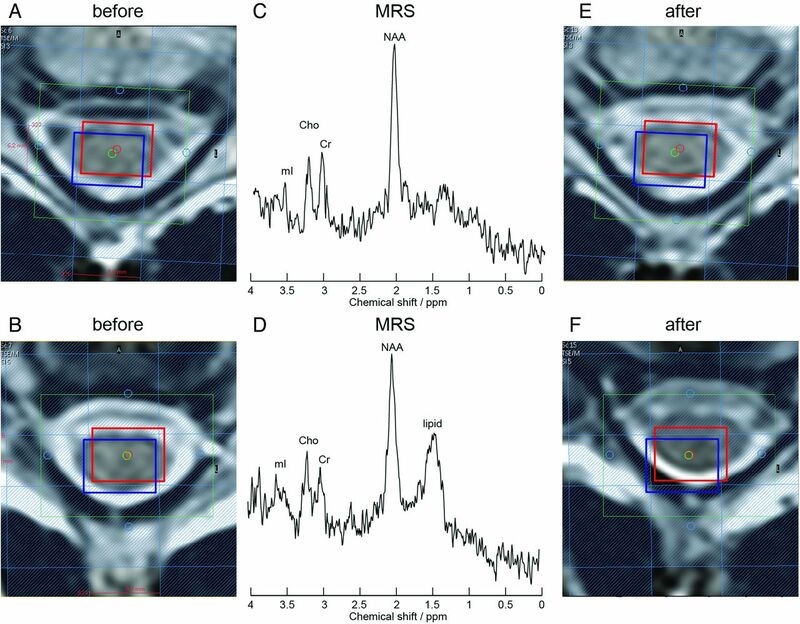 A review of the literature revealed several publications using 1H-MR spectroscopy in clinical studies in which different pathologies were investigated. Five investigations focused on multiple sclerosis and reported a general reduction in the NAA/Cr ratio in the spinal cord of patients with MS (On-line Table 2).9,12,16,20,33 One of these studies published by Marliani et al20 exhibited a proper spectral quality documented by relatively high SNR, low line width, and sample spectra. They studied 15 patients with relapsing-remitting MS with at least 1 lesion in the measurement voxel (On-line Table 2), and they compared the results with those in healthy subjects.21 Besides the decrease of NAA/Cr, they found an additional significant decrease of NAA/Cho and an increase in Cho/Cr and myo-inositol/Cr in patients with MS.
Four publications investigated tumors in the human spinal cord. Kim et al3 investigated 14 mass lesions. They reported specific MR spectroscopy changes, similar to changes seen in MR spectroscopy of central nervous system tumors. They provided exemplary spectra measured in vivo and ex vivo. However, they did not show any quantification or metabolite ratios and quality evaluation of their results. Dydak et al25 investigated 1 patient with a tumor in the cervical spinal cord. They showed that lactate and myo-inositol are increased compared with healthy spinal cord tissue by visual inspection of the spectrum, but they also did not provide metabolite concentrations and quality indicators. Henning et al17 reported 2 patients with spinal cord tumor (1 located at C4–5 and 1 at T9) with sufficient shim of 12 Hz (FWHM of the water peak) at 3T. Besides a decrease of NAA and Cr, an increase of Cho and myo-inositol was observed. In addition, they reported an increased lactate and glutamine/glutamate peak in the tumor tissue (On-line Table 2). However, the spectra had a low SNR. Finally, Hock et al33 presented 3 patients with neoplastic spinal cord lesions and compared the spectra with those from 13 healthy volunteers and 13 patients with MS (On-line Table 2 and Fig 3). Spectra were of good quality, and low CRLB were provided. However just acquisitions with short TEs were acquired. The measured ependymoma showed strongly reduced NAA/Cr, increased Cho/Cr, and strongly increased myo-inositol/Cr in addition to lipids and lactate compared to metabolite over Cr ratios measured in healthy controls. Holly et al11 investigated 21 patients with cervical spondylotic myelopathy and compared the results (On-line Table 2) with those in 13 healthy volunteers (On-line Table 1). Voxels with the unusually large size of 10 × 10 × 15–20 mm were placed at the C2 level (because the spinal cord has a diameter of approximately 10 mm, a significant amount of surrounding tissue or CSF must have been included in the voxel). They reported insufficient B0 shim values between 18 and 25 Hz at 1.5T; no CRLB and no SNR values were given. The displayed exemplary spectra seem to have low spectral quality (low SNR, probably phase-shifted). Furthermore, an additional acquisition with longer TEs to differentiate lactate and lipid would be beneficial to verify the presence of lactate in this patient group. Rapalino et al13 investigated cervical spondylosis in 8 patients (On-line Table 2) and compared the results with those in 6 healthy volunteers. They noticed a decrease of the NAA/Cr ratio and an increase of Cho/NAA in patients, without presentingquality indicators apart from 2 exemplary spectra with relatively low SNR. Carew et al22 and Pineda-Alonso et al28 used their previously published methods27 to investigate amyotrophic lateral sclerosis in 14 patients (On-line Table 2) and 16 controls (On-line Table 1). They could show that NAA/Cr and NAA/myo-inositol were reduced in patients with amyotrophic lateral sclerosis, and the reduction correlated significantly with clinical parameters. However, in the presented sample spectrum, a baseline distortion most likely due to a widespread water peak indicating insufficient water suppression could be observed, which might have negatively impacted spectral quantification. De Vita et al23 presented data from 14 healthy volunteers (On-line Table 1) and 8 patients (On-line Table 2) after brachial plexus root re-implantation. They found a significant increase of the myo-inositol/Cr ratios in the patient data sets. The data quality was documented with exemplary spectra, line-width information, and CRLB, but no SNRs. However it seems that the SNRs of their data are quite low and a difference in data quality between patients and volunteers was seen, which should be discussed. Hock et al37 also presented data of patients with traumatic injuries (On-line Table 2). A decrease in NAA/Cr and an increase of myo-inositol/Cr were observed. However, the spectral quality was reduced in these patients in comparison with healthy volunteers and patients with MS, most likely due to implants and the presence of hemorrhage (Fig 3). All published studies report specific changes when comparing patients with healthy volunteers, indicating the feasibility and the potential of applying MR spectroscopy to the spinal cord. Especially, NAA and myo-inositol seem to be meaningful markers for the investigation of various diseases. However, more studies with high spectral quality in larger patient cohorts are needed to increase diagnostic confidence with respect to the degree that MR spectroscopy can enhance specific differential diagnoses or to provide a tool for monitoring the course of a disease. MR spectroscopy has the potential to evolve into a powerful tool for the investigation of biochemical changes in the spinal cord. The significant MR spectroscopy changes present in patients with different disorders, compared with healthy subjects, corroborate the clinical diagnostic potential of this method. However, to yield reliable results, certain quality criteria, related to both data acquisition and quantification, of the various metabolites need to be presented. Therefore, SNR, CRLB, coefficient of variation, SD, and exemplary and average spectra are necessary to give an impression of the data quality. Furthermore, the significance and sensitivity have to be investigated in large subject cohorts and in the context of multimodal imaging protocols. To accelerate the transfer of spinal cord 1H-MR spectroscopy from research and development to clinical practice, further technical progress improving spectral quality and robustness is helpful. Furthermore, the applicability has to be enhanced (eg, automation of postprocessing and quantification steps), the total scanning time should be minimized, and standardized acquisition and quantification protocols are necessary for comparison of the data. Another unsolved problem is the spectral quality of the measurements in more caudal regions of the spinal cord (ie, the thoracic and lumbar regions). The additional challenges discussed above have prevented the acquisition of satisfactory MR spectroscopy results to date. Increasing SNR due to progress in technology may enable reliable measurements in these regions in the future. MR spectroscopy of the spinal cord is a promising tool for research and diagnosis because it can provide additional information complementary to other noninvasive imaging methods. However, the application of MR spectroscopy in the spinal cord is not straightforward, and great care is required to attain optimal spectral quality. The authors thank Erin L. MacMillan for proofreading and for the helpful discussions. Disclosures: Andreas Hock—RELATED: Grant: National Centre for Competence in Research: Neural Plasticity and Repair. * Anke Henning—RELATED: Grant: National Center of Competence in Research,* Comments: Grant to Spyros S. Kallios, UNRELATED: Grants/Grants Pending: Swiss National Science Foundation, Payment for Lectures (including service on Speakers Bureaus): annual MR spectroscopy block course, Travel/Accommodations/Meeting Expenses Unrelated to Activities Listed: University of Zurich, International Society for Magnetic Resonance in Medicine. Peter Boesiger—UNRELATED: Board Membership: editorial Boards of scientific journals, Comments: no financial compensation, Consultancy: consultancy for technical development of MRI, Grants/Grants Pending: Swiss National Science Foundation,* Philips Healthcare,* Patents (planned, pending, or issued): license fees for technical patents on MRI. *Money paid to the institution. Accepted after revision July 25, 2012. Can We Perform Spinal 1H-MR Spectroscopy in Daily Clinical Practice?